What are your seating arrangements? Have you thought about how far apart your board members sit at a meeting? I was interviewing a pretty amazing board chair on a project recently. She was telling me how much more engaged the current board was and how much they were feeling like a team. Whack on the side of the head! I had to stop and write it down. Distance in the board room does not necessarily make the heart grow fonder! Take note of how far apart your team is. You’ve experienced this, I’m sure. Multiple tables are configured into a big U or rectangle, but there is great distance between the tables. While board members may be able to see each other, they are physically very far away from one another. It’s often easy to hide when you are far apart. 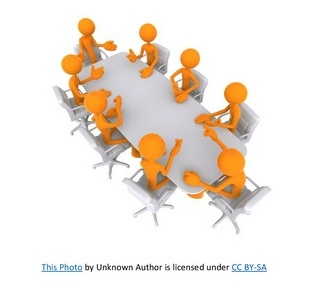 When the meeting facilitator sits at the “head of the table,” it increases their perceived authority. So if you see yourself as a collaborative leader, take a seat in the middle. Folks like to sit where they sat before. So use table tents and move seating around from meeting to meeting. It encourages board members to get to know folks they don’t know as well. Get everyone up to the table. It’s easy to hide in the back row and it signals distance from the rest of the group. If the table isn’t big enough, find a new space to meet. (Or maybe your board has gotten way too big). Maybe King Arthur had the solution.. a round table. Can you provide a suggested logistical solution for a non-profit BoD whose structure is 9 (voting) members plus 1 past president (non-voting), and whose terms are three years, whereby every year three members leave the Bd (except the Past President), and three new members join the Bd. In this model, the Bd member who is made President (always in her/his third year) is President only for that one year. We would like a two year term for the President, and then one year for his/her role as past president. What could be the appointment logistics to effect this? Gia, In all likelyhood, you can amend your bylaws to extend the board term for anyone serving as the President. Or, as officers do not have to be board members, you could consider that structure as well. I would also check with your state law. And I might also suggest not waiting until their final year to elect someone as President, that could happen earlier and then the problem would be solved (especially if the past president position is a non-board member officer). What do you like about having a past-president?